This is an ex-library book and may have the usual library/used-book markings inside. This book has hardback covers. With usual stamps and markings, In good all round condition. No dust jacket., 550grams, ISBN: 0670801682. Sendak, Maurice. Very Good. Text in English, German. 40 p. Viking Kestrel picture books . Colour illustrations. Intended for a juvenile audience. A previously unpublished story by one of the Grimm brothers, the pre-eminent 19th century collectors of folk tales from Northern Europe, which is written in the form of a letter to a young girl and it tells how a mother sends away her child into the forest at a time of war. Sendak, Maurice. Good. Text in English, German. 40 p. Viking Kestrel picture books . Colour illustrations. Intended for a juvenile audience. A previously unpublished story by one of the Grimm brothers, the pre-eminent 19th century collectors of folk tales from Northern Europe, which is written in the form of a letter to a young girl and it tells how a mother sends away her child into the forest at a time of war. 1988. Viking Kestrel. Hard Cover. Book-VG. DJ-VG+. Dj-VG. 9x10. Profuse colour illus by Maurice Sendak. Sendak, Maurice. New. Picture book. Sewn binding. Cloth over boards. With dust jacket. 40 p. Intended for a juvenile audience. Used-Very Good. VG hardback in VG dustjacket. 1st edition thus. Binding tight; dust jacket not price-clipped. 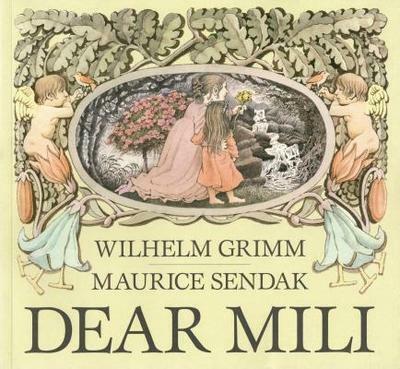 An old tale by Wilhelm Grimm newly translated by Ralph Manheim with pictures by Maurice Sendak.